This article illustrates and describes several examples of Aterian stemmed or tanged projectile points from Morocco in northwest Africa. The Aterian culture dates to the late middle Paleolithic period, sometime before 40,000 years ago and came to an end about 30,000 years ago. 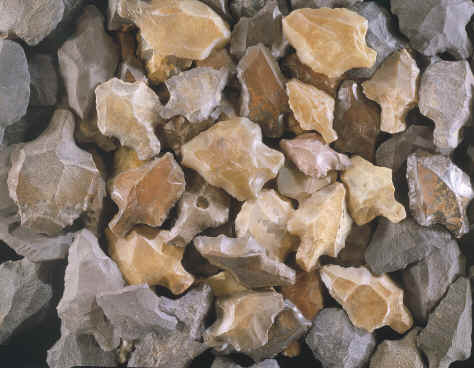 Aterian points were developed out of the Mousterian stone tool industry characterized by Levallois technology. Large numbers of these points were made over a wide area of North Africa. They were used to hunt many different species of grazing animals such as white rhinoceros, extinct camel, gazelle and antelopes. Aterian Industry: Its Place And Significance In The Paleolithic World,"
"The Aterian is one of the most widely distributed Paleolithic industries of North Africa, extending from the Atlantic almost to the Nile Valley and throughout much of the Sahara. ".---1975, C. Reid Ferring, "The Aterian In North Africa Prehistory," pp. 113-126. "(The Aterian) is distinguished by the use of different kinds of tanged, or stemmed, points, suitable for inserting into handles or attaching as heads of spears, and similar projectiles." ---1971, J. Desmond Clark, "African Beginnings," p. 29. The Aterian Industry was named after the type site called Bir el Ater located in northwestern Africa in the country of Tunisia. The earliest Aterian sites are believed to be well over 40,000 years old. An Aterian kill site called BT-14, located 350 kilometers west of the Nile, produced a carbon date from shell of 44,190 plus or minus 1,380 years. Aterian sites end about 30,000 years ago when climate change forced the abandonment of most sites when the grasslands of the Sahara began drying up. This picture shows a large number of tanged Aterian points that are reported to have been collected on sites in southern Morocco. They were all made from simple thick flakes struck from cores. Tanged Aterian points are very heavy duty projectile points. The smaller examples (they are reported up to 8 or 9 inches (20 to 22 cm) long) are believed to have been hafted onto darts or spears that were thrown by atlatls (spear throwers). These points were used to hunt large grazing animals such as white rhinoceros, extinct camels and large bovine (ox-like or cow-like). They were also used to hunt smaller animals like gazelle, fox, jackal, warthog, antelopes and ostrich. The points illustrated here were made from a variety of different cherts and some that appear to be Basalt or Rhyolite. They range in size from 2 5/8 inches (6.6 cm) long to 1 5/16 inches (3.3 cm) long. Thickness ranges from 1/4 of an inch (5.5 mm) to 9/16 of an inch (1.4 cm). Aterian sites are found over a wide area of North Africa. In fact, C. Reid Ferring (1975) states that "The Aterian is one of the most widely distributed Paleolithic industries of North Africa." Aterian sites are found in Morocco to Tunisia in the northwest and over much of the Sahara desert almost to the Nile Valley of Egypt to the east. This picture shows three views of a good representative example of a tanged Aterian point. It was made on a thick flake that was trimmed to a point on one end and notched on both sides of the bulb-of-percussion on the other end to form the tang. The center edge view shows the thicker bulb-of-percussion at the stem or tang hafting element. This point was made from very good quality semi-translucent chert that is represented by only 3.5 percent of the 70 examples illustrated in this article. It's also heavily patinated with desert varnish caused from wind blown sand. This point measures 1 7/8 inches (4.8 cm) long, 1 1/4 inches (3.2 cm) wide and 3/8 of an inch (9 mm) thick. The Aterian industry developed out of Mousterian stone tool technology. Their blades were produced from cores made with Levallois technology. It's interesting to note that most human fossils associated with Mousterian industries are Neanderthals. But archaic modern humans have been found associated with Mousterian sites from Morocco to Israel. The Aterian people were using Neanderthal stone tool manufacturing techniques but they themselves were probably early modern humans. Discoidal and tortoise cores produced by Levallois technology is a more wasteful process if compared to later core and blade technology that developed during the Aurignacian period. But the older technology, as shown in the archaeological record, worked quite well. 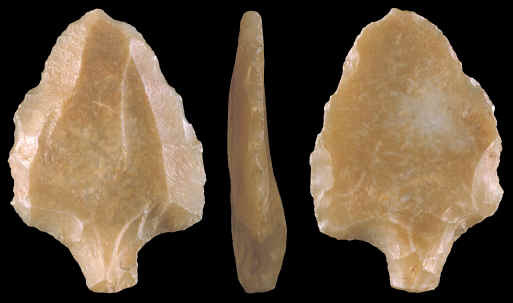 This picture shows one of five or six examples of tanged Aterian points, illustrated in this report, that were made from a fine quality semi-translucent chert. This point measures 1 3/4 inches (4.4 cm cm) long, 1 3/16 inches (3 cm) wide and 3/8 of an inch (9 mm) thick. Aterian tanged points are one of the oldest types of projectile points. The smaller examples are thought to have been used on darts or spears that were thrown by atlatls. The issue has been controversial though. Archaeologist like G. Canton-Thompson suggested, as early as 1946, that Aterian points were used on arrows. But, in recent years, the most accepted device is the atlatl instead of the bow. 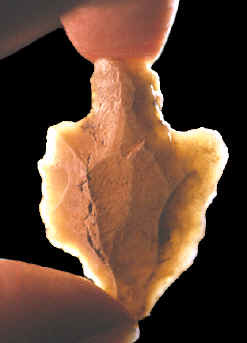 Archaeologist Michael A. Hoffman wrote in 1984, "----these artifacts (Aterian points) seem at once too big and too bulky to have been used as projectile points on primitive arrows. ----they were probably employed as dart points in spear throwers, certainly not as arrowheads." 1946, Canton-Thompson, G., "The Aterian Industry: Its Place and Significance In The Paleolithic World," The Huxley Memorial Lecture for 1946, p.89. 1975, Ferring, C. Reid, "The Aterian In North African Prehistory," "Problems In Prehistory: North Africa And The Levant," pp. 113-126. 1975, Jelinek, J., "The Evolution of Man," p. 147. 1984, Hoffman, Michael A., "Egypt Before The Pharaohs," pp. 66-70. 1988, Tattersall, Ian, Delson, Eric & Couvering, John Van, "Encyclopedia of human Evolution And Prehistory," p. 62.